A good foundation can make or break your makeup. Your blush, bronzer, concealer even lipstick tends to fall flat if the foundation is not good enough. 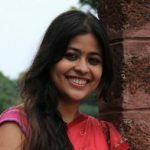 The search for a good foundation is almost like searching for the right life partner, thus, not easy. It has to match and complement you perfectly and last long. This quest for the perfect foundation is particularly difficult if you have an oily skin. 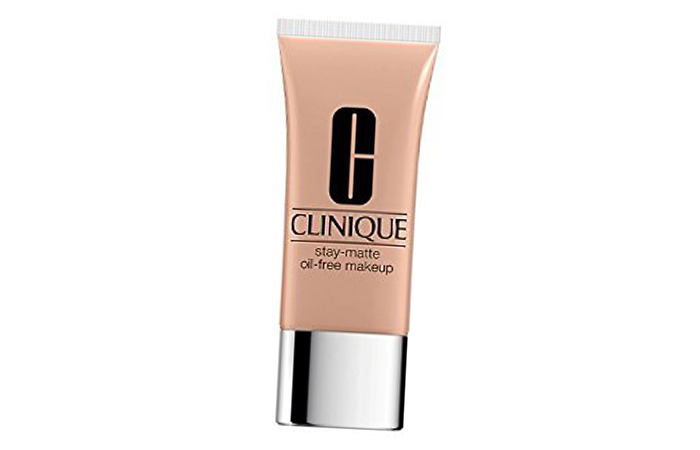 Most foundations on oily skin slide off minutes after wearing it and make the face look shiny, no, not the right kind of shiny, but greasy sandwich kind of shiny. However, if you are ready to shell out good bucks, these high-end foundations from some of the hottest and most prestigious brands in the world, actually works. 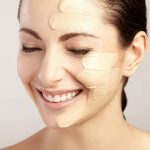 Following 15 are the best foundations for oily skinned women. When it comes to coverage and lasting power, this is a real deal. The texture is light and a little runny. The foundation sets very quickly and lasts forever, and is non-transferable. In fact, it requires a powerful makeup remover to get rid of it completely. 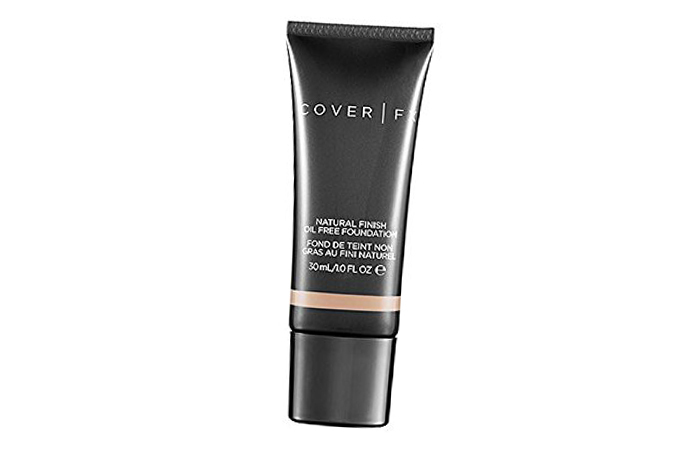 It gives a heavy coverage, covering all marks, blemishes or pigmentations, even when used without a concealer. But, even then, the finish looks silky smooth and not cakey. It is also extremely efficient in controlling oil. However, because of its oil controlling properties, it tends to dry out the skin, thus hydrating and moisturizing the skin before an application is recommended even for people with oily skin. The SPF 10 provides satisfactory sun protection. You know something is special about a product when Kim K raves about it personally. 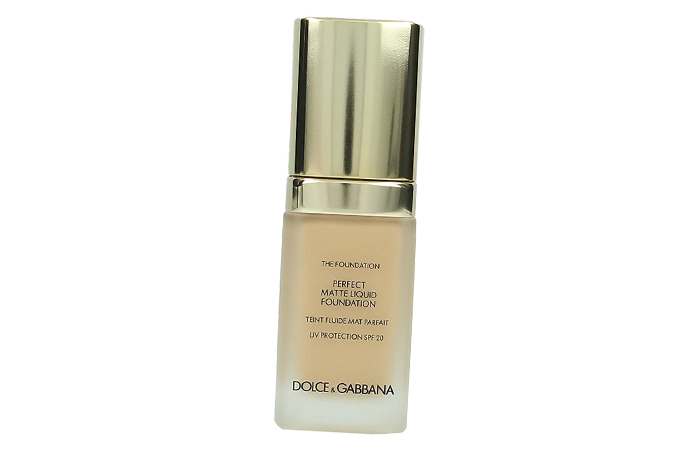 A favorite of professional MUAs, this foundation provides a satin matte finish without being oily or greasy. This one comes with a pump as well, which is ideal for measuring out the right quantity and ensures value for money. The creamy, almost weightless formula blends in really well. The coverage it provides is highly versatile and can be used for sheer, medium and high coverage by altering the blending techniques. The product promises to last 15 hours but does a good job only for 8 hours, which by no way is less. Although it is oil free, it’s hydrating and gives a healthy glow with a radiant, dewy finish that photographs beautifully. 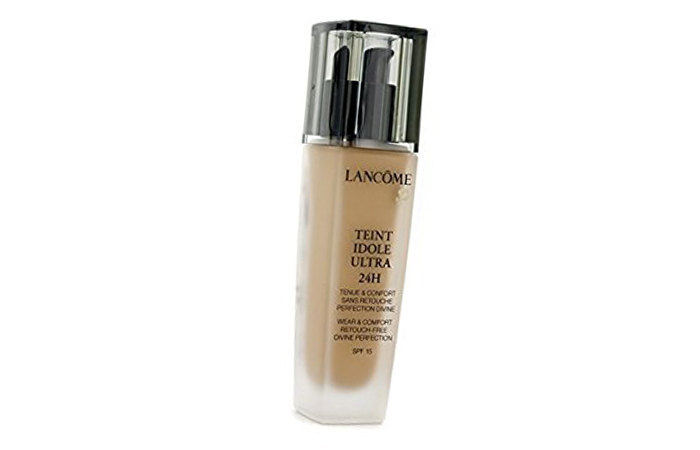 Description: Another luminous formula on the list, it claims to go a long way with a little amount. A favorite among many beauty gurus, it has a loyal fan base that swears by its beautiful finish and heavy duty longevity. The container comes with a pump, but it can be a little tricky to use. The formula is on the runny side, but not exactly watery. It gives a natural finish which falls exactly between matte and dewy. The longevity of the product is heavy duty, and the 15-hour claim is not highly exagerrated. It remains put and shine-free for at least 12 hours, and with a little setting powder can easily touch the 15-hour mark. However, it tends to go a little overboard with the oil control, as it dries out the skin too much for comfort and can accentuate dry patches. It provides a sheer to medium coverage, but building it for full coverage might end up in a cakey appearance. Though it’s available in a wide variety of shades, yellow undertones dominate the choices. 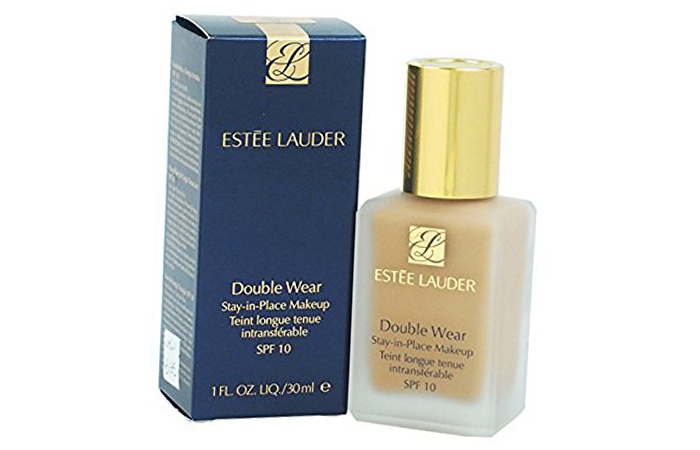 Another top favorite of many beauty enthusiasts, this foundation has a powdery finish to it that is oil-free, velvety matte finish for long hours. 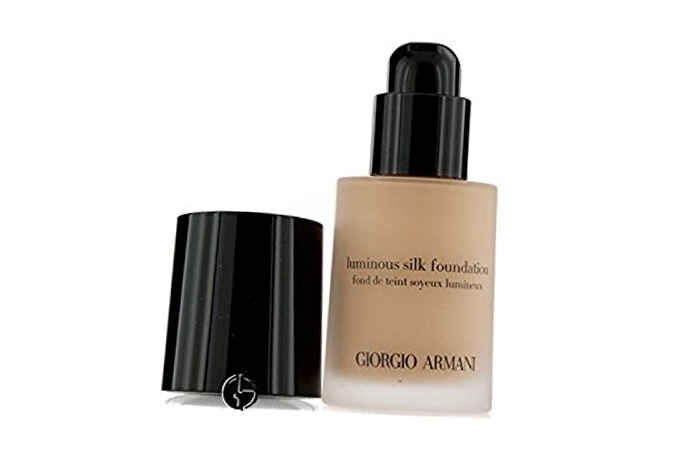 Enriched with cashmere kaolinite clay, this liquid foundation turns into a powdery formula once applied. It truly remains oil-free for long hours. The coverage provided is exceptional, as it covers all blemishes and imperfection for a flawless and glowing matte finish. Though there are fans, who rave about the excellent coverage and finish, on some skin types the color seem to oxidize into a darker shade after few hours of application. The foundation comes in a very limited variety of shades, thus finding the perfect match for every skin tone can be a challenge. This foundation has been specially formulated to adjust the oil level on the skin according to the temperature outside. The company claims it provides shine-free coverage for 24 hours. 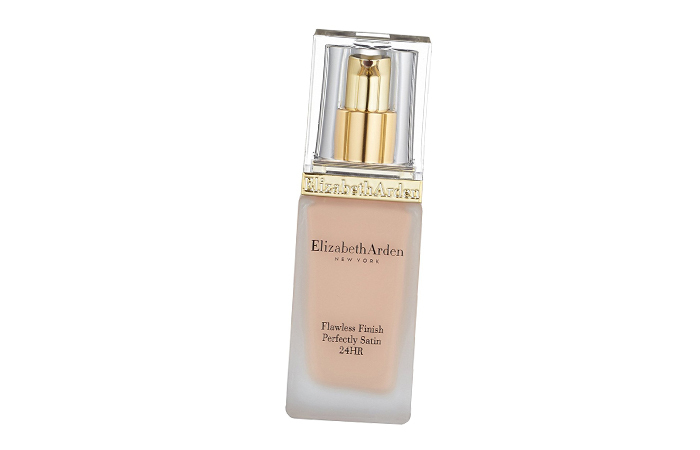 The foundation comes with a classic Elizabeth Arden Packaging, with a pump for easy application. 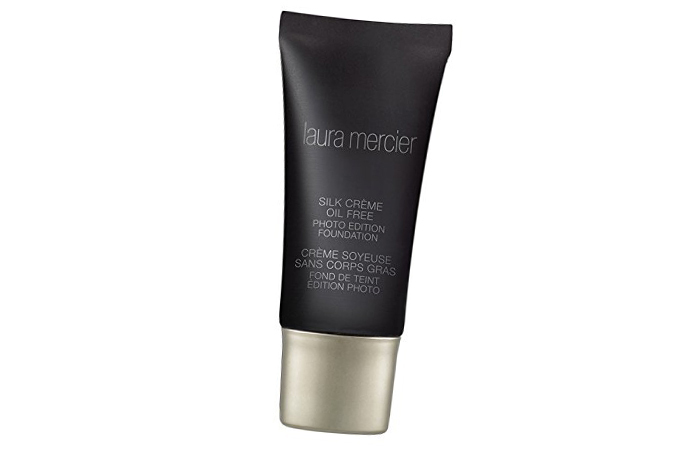 The product feels silky smooth on the skin and gives a medium coverage that is buildable for a high coverage. The Time Release technology is quite effective, and the foundation balances out the oiliness well, without drying it out completely. SPF 15 provides satisfactory sunblock. However, the 24 hours long lasting claim is a little exagerrated, as it gets oily after 8-10 hours. But even then a little bit of blotting can prolong the longevity, and 8-10 hours coverage is not bad either. Silky, photo-ready finish with a 12-hour shine-free experience is what this foundation claims. A revamped version of the previous product by the same name, this one promises to take oil-free flawlessness to a new level. 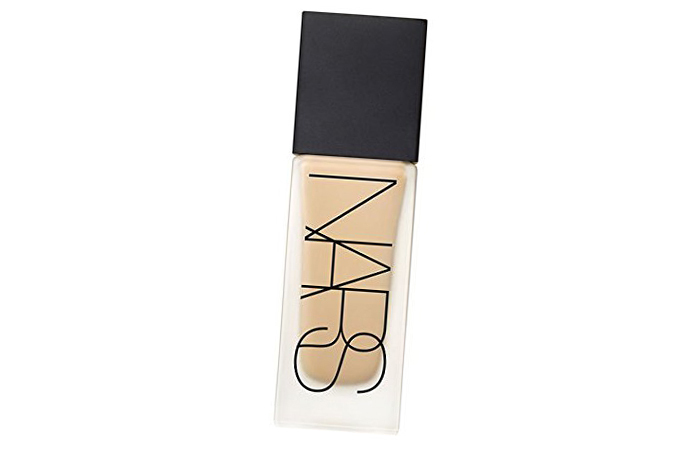 The best part about this foundation is the beautiful flawless coverage it gives with a subtle dewy finish. It actually looks like the second skin, yet does not give a cakey look. It comes with a limited variety of 12 shades and finding a perfect match for darker skin tones can be a little tricky. The oil control though not as long lasting as 12 hours as promised, does a decent job for 6 plus hours. However, with a hefty price tag like this one, 6 hours keeps you a little wanting. The photo-ready claim stands true, as you can notice the beauty for yourself. This cleverly named product claims to blur the lines between makeup and skincare. It promises to give a naturally flawless finish that would look like you have nothing but enviably gorgeous skin on. The packaging is cute and girly like all Too Faced products and the bottle comes with a pump. The formula is neither runny nor thick and the coverage it provides is really natural. It initially provides medium coverage but can be built up for a fuller coverage. The added layer does not look cakey. Although it is not specifically designed keeping oily skin in mind, it holds up really well for 6-7 hours. A little touch-up with a setting powder can prolong the wear in case of a really humid condition. With natural polymers and a highly pigmented formula, this foundation promises to provide 24 hours of velvety smooth and flawless skin. The packaging is slightly goth-inspired which makes for an interesting appearance. The texture is smooth and creamy, but blending takes a little effort. It provides medium coverage and can be built for higher coverage. Once applied, it really stays put for the day and provides a soft matte finish. In fact, it takes a heavy duty makeup remover to get rid of it. It can feel a little too drying on certain skin types. This oil-free foundation is one of the cleanest formulae on the list, which makes it popular among people with sensitive skin. It promises a flawless coverage with long shine-free hours. The product comes in a tube and does not have a pump dispenser. The specially created formula is clean and free of parabens, sulfates, and gluten. The foundation has a thicker consistency but does not take a lot of effort to blend in. It offers mostly medium to high coverage. It gives a natural matte finish and stays put for good 8-10 hours. The foundation comes in an excellent array of shades, keeping in mind warm, cool and neutral undertones that allow you to find the perfect match. This foundation promises to provide oil control, even for oiliest of the skins, for long hours. This one also blends into a powdery finish, without giving the face a mask-like appearance. This one comes in a fancy packaging as you would expect from any Dolce & Gabbana. The liquid foundation blends into a powdery finish to ensure a natural matte look, that does not budge until washed off intentionally. It can be a little drying on the skin and can accentuate dry and rough patches. It has an SPF 20 that provides optimum sun protection. 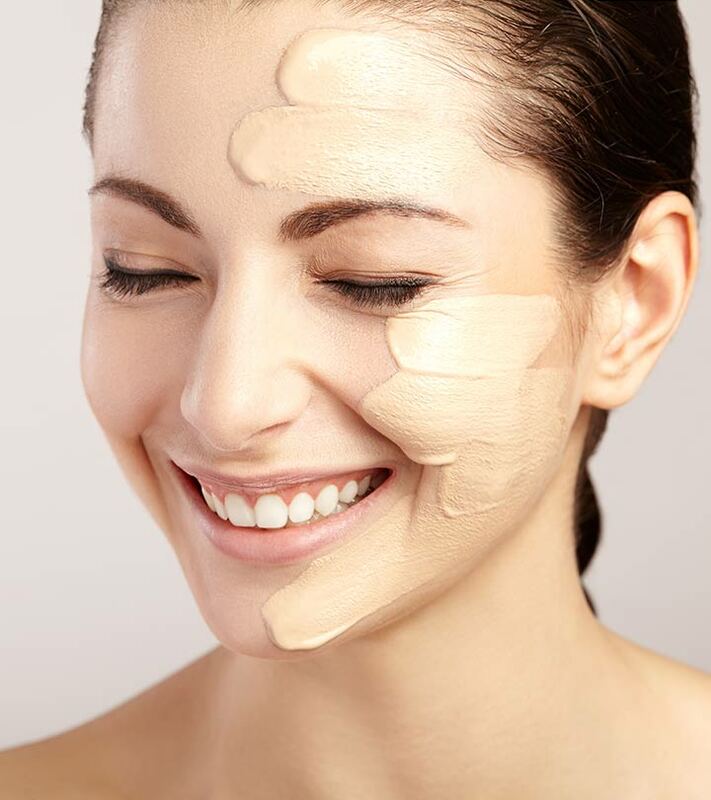 However, the color of the foundation tends to oxidis and get darker after few hours of wearing it, which makes choosing the right color a little tricky. The foundation also does not offer a wide range of colors to choose from as it comes only in 14 shade variants. Although it’s a good foundation for oily skin, when you compare the benefits with the hefty price tag, it offers nothing extra that you would normally expect from something this pricey. 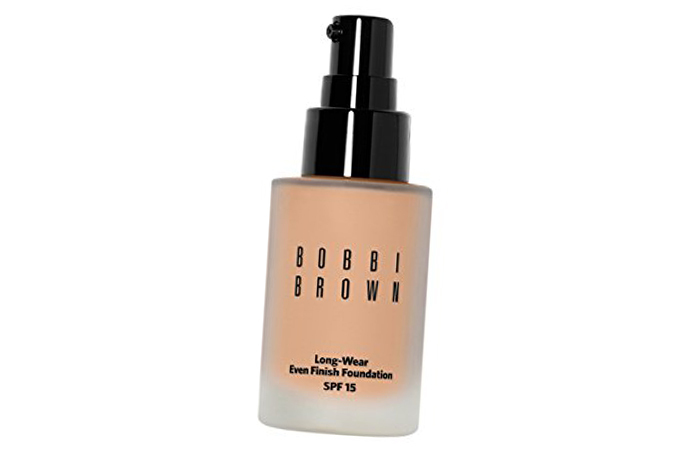 A favorite among many makeup lovers, this foundation promises a natural finish with a 24 hours oil control. The product comes in an attractive packaging with a pump for easy access. The smell though pleasant can be overpowering to some. It glides on smoothly and gives a beautiful flawless matte finish. It can be blended easily for a sheer coverage or built up to give medium to high coverage. The shades are designed keeping the warm, cool and neutral undertones in mind, thus finding a perfect match is easy. The oil control is really effective and it actually stays put all day long providing a shine-free experience. The formula is quick drying which is achieved by a high level of alcohol content. However, the high alcohol content apart from rendering the skin dry can cause other skin problems as well. 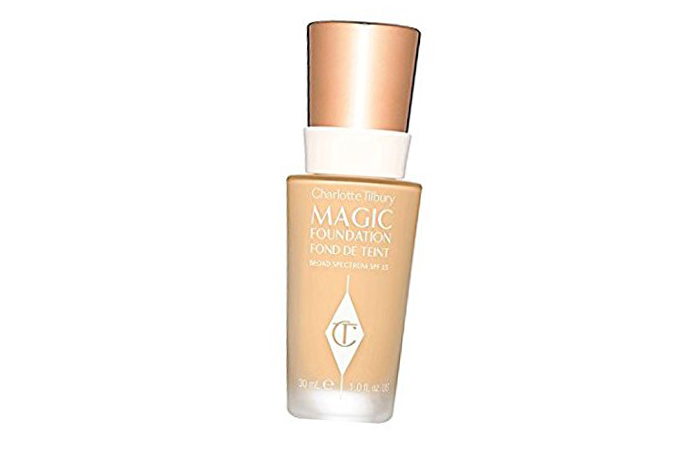 Touted as the ‘magic’ foundation, this one apart from matte, oil-free, medium coverage finish, also claims to have anti-aging properties. It comes with a pretty but not very practical packaging. The consistency is that of a moisturizer and blends easily. However, because of the quick drying properties, it needs to be blended quickly, preferably with a beauty blender. It offers medium coverage and can be built for a higher coverage. However, it takes a few layers to achieve total coverage. It easily stays put for 8-10 hours even with high humidity. 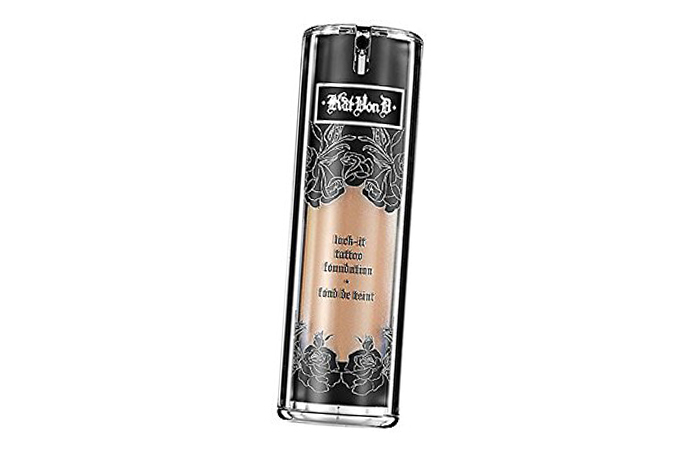 One of the most popular products in the market, this foundation comes enriched with shea butter and glycerin and contains Vitamin C and E. The foundation also claims to stay put for 12 hours on oily skin. Creamy, lightweight texture blends in easily. The foundation comes in a 10+ variety of shades, thus everybody can find their perfect match. The container comes with a pump which is hygenic, but the glass bottle is too heavy to be carried around. The texture is easily blendable. It gives medium to high coverage and thus some can skip using concealer depending upon desired coverage. The yellow undertone of the foundation complements the Indian skin tone well. However, the 12-hour claim is exagerrated, as it starts sliding in 3-4 hours. Setting powder or compact powder can prolong it for another 2-3 hours. Lightweight and fragrance-free, this foundation promises to provide perfect coverage with no oiliness all day long, for an oily and sensitive skin. The product comes in a portable tube packaging. It gives a nice matte finish, though the formula provides fairly medium coverage and is hard to build up for a higher coverage. It is perfect for the ‘no-makeup look’. Also, the oil control claims are not entirely true. On very oily skin types the product is unable to provide proper oil control after 4-5 hours. It also sits on the pores and emphasizes fine lines and wrinkles on some skin types. However, it does not cause allergies or breakouts. 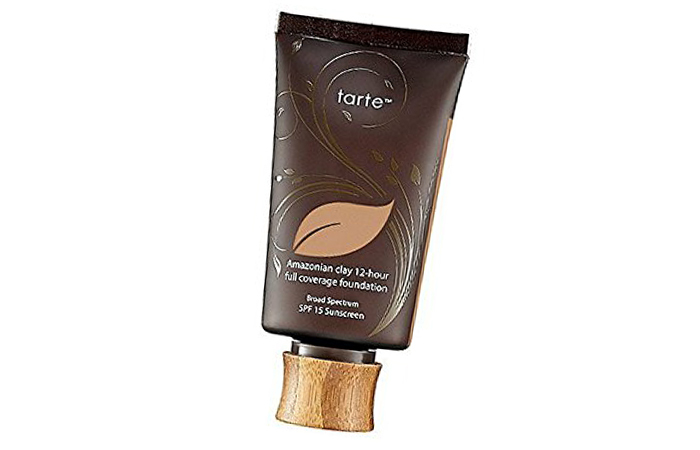 This foundation infused with Amazonian clay is a favorite among many for its flawless finish and clean formula. It claims to provide coverage for 12 hours on oily skin. The foundation has one of the cleanest formulae among foundations available in the market. It’s paraben free, gluten free, not tested on animals and contains natural sunscreens like titanium dioxide, so is safe for the sensitive skin. However, the color options are fairly limited making it a little hard to find a perfect match. The product comes in a tube with a wooden top, thus it is hard to get to the last drop. The texture is a little on the thicker side but blends easily. It gives a nice satin matte finish and provides medium coverage. It controls oil without drying out the skin. However, the product does not hold true to its longwear claim. It starts wearing off within 5-6 hours, even with setting powder. It is a good idea to use a primer before applying the foundation. It comes with SPF 15 which provides adequate sun protection. I know you are thinking if the price tag of the products is worth it. Well, that is entirely left to your discretion. But keep in mind oily skin is especially susceptible to acne and breakouts and thus it becomes all the more necessary to use products that agree with your skin. These foundations have been specially formulated to tackle oily skin and the issues that come with it. Also, with something as essential as a foundation, an occasional splurge is justified, given they also have a relatively long shelf life. Tell us what is your favorite foundation and do let us know if you have used any foundation on this list and if you liked it, in the comments section below.